Like the dawning of a brand-new day, the Holy Spirit is breathing new life into the Church of God in central California. Over the past five months, several structural and functional changes have been received warmly by a family of congregations seeking direction and revival. Under the leadership of their new regional pastor, Michael Guzman, the Central California Association of the Church of God has since developed strategies to increase efficiency, maximize potential, and take back what hell has stolen. The gates of hell have no doubt begun to shake, as these strategies are already beginning to bear fruit. Michael Guzman, who also serves as pastor of the Church of God of Exeter, had served on the executive council of the region for three years. 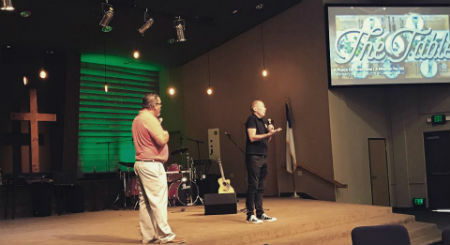 A good friend to former regional pastors Roger Chamberlain and Jerry Davisson, Michael Guzman began to feel the nudge of the Spirit when he learned the position would soon be vacated. Not only that, but he’d also seen a vision of a dome-like disc covering central California; it was as if the Lord was inviting Michael to take a direct role in helping to “lift the lid” of kingdom potential from the region. But it wasn’t so simple. Michael was not sensing release from his flock in Exeter. There was so much more to be done there, too. After much prayer and consultation with his wife, his church, and association leadership, it became clear that this is what God was calling him to do. However, God was not calling Michael to frustration and burnout. Some things had to change. Michael Guzman (left) visits with Spanish-speaking pastors Nephtali Benavides and Noe Espinoza. “I believe we have way more power and resourcing currently in our region than we recognize,” Michael explains. “We have doctorates, master’s degrees, counseling experience. The problem is we don’t always turn these resources back to the region…Because of technology, we can accomplish training and resourcing without traveling loads of hours to get in touch with people. We’ve got to utilize what we already have.” As such, partnership is key to Michael’s vision for the Church of God in central California. Their relationship with Youth for Christ is one example. The Church of God congregation in Dinuba had declined. Some may have believed hell had won the battle as its doors closed. But Youth for Christ representatives had been walking by the closed church for months wondering and praying about the possibilities. One of Michael’s rallying messages for the region is “Jesus is the subject.” This means that they really can go back to their Church of God roots and reach their hands in fellowship—and partnership—to every blood-washed one. Through an agreement with the association, Youth for Christ meets there regularly through the week, but yields to the association when necessary for Church of God ministry. Part of Michael’s vision is to see a Spanish-speaking Church of God planted at that location. Central California is reclaiming what hell had stolen! 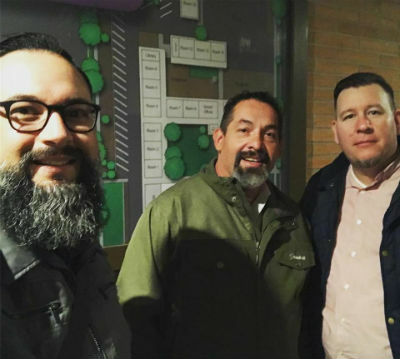 Dinuba isn’t the only community where the need for Spanish-speaking ministry is imminent. Michael explains that 60 to 80 percent of the entire area is made up of people whose first language isn’t English. First Church of God in Santa Maria is already addressing the problem with excellence by hosting a Spanish-speaking congregation in their building. Michael’s long-term vision is to see every central California Church of God do the same thing. Jim Lyon addresses the gathered Churches of God of central California. Thus, Michael is busy meeting with pastors, but not on Sundays; now there’s ample time to really get to know them (and he can lead at Exeter). He’s also bringing his family with him, not leaving them behind for the busy work of ministry. He’s utilizing social media and video to tell the stories of what God is doing, further connecting the interdependent family of churches. It’s a new day in the Church of God in central California, and God has only just begun to write their new story. This entry was posted in All Church of God, Give Life, Western and tagged central California, change, Church of God of Exeter, cross-cultural, Hispanic, Jesus Is the Subject, kingdom partnership, Michael Guzman, mission, multicultural, Reclaim, reclaim what hell has stolen, regional association, rejuvenation, revitalization, revival, Spanish-speaking, state assembly, strategy, Youth for Christ. Bookmark the permalink.